BitRecorder - leader of record social video and audio revolution, is devoted to new generation web recording, such as video/music/streaming media from Myspace, YouTube, Imeem, Pandora, last.fm, emi.fi and other sites, and to make general recording easier. 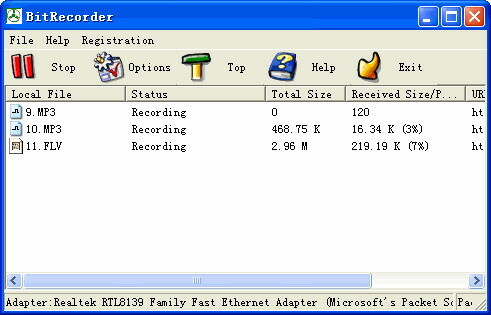 BitRecorder can Record all kinds of FLV format Flash Videos through HTTP and RTMP protocol and catch MP3 streaming files. And It No Spyware. No Viruses. 100% Guaranteed. * Catch MP3 streaming files. You get the perfect solution for recording the free video and audio from below sites. Qweas is providing links to BitRecorder 1.72 as a courtesy, and makes no representations regarding BitRecorder or any other applications or any information related thereto. Any questions, complaints or claims regarding this application BitRecorder 1.72 must be directed to the appropriate software vendor. You may click the publisher link of BitRecorder on the top of this page to get more details about the vendor.